I guess it’s time to introduce myself. I am the new guy at SJ Games HQ and, to my best knowledge, the first German SJ Games ever hired as full-time staff member. In May 2012 I became the charismatic leader of the Men in Black, the volunteer arm of SJ Games, who in the guise of normal, everyday game enthusiasts help to further the agenda of the Secret Masters. The MIBs also do blatantly obvious things like run demos and tournaments of SJ Games products at conventions and talk them up at game stores. This several hundred-strong team of friendly and outgoing SJ Games fans is sent on missions all over the world. I know what I am talking about because when I was mad enough to run INWO tournaments in the mid 1990s, it didn’t take long before Evil Stevie pointed his Orbital Mind Control Lasers at me and made me one of them. Since then I have been on a mission to promote illuminated goals wherever people gather to play games, and I followed the classic path that leads to employment in the game industry. 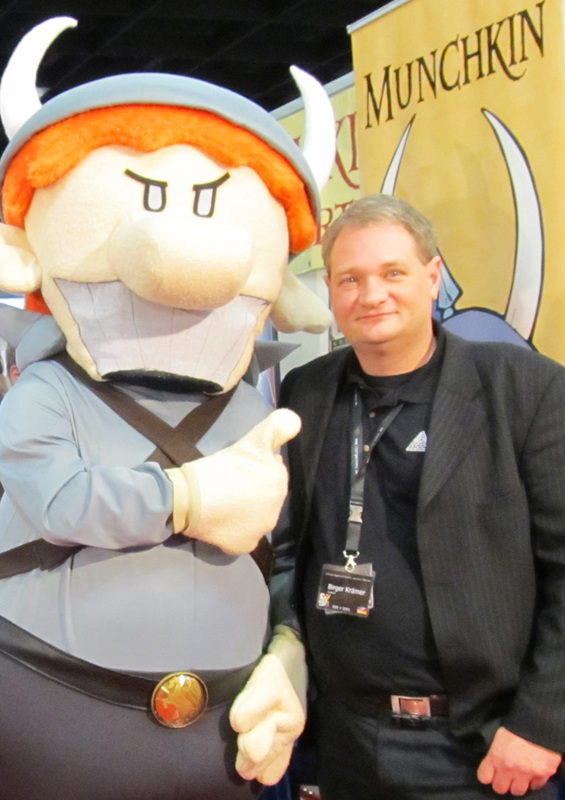 The events I ran at conventions grew bigger and bigger, and I took the chance to translate Munchkin as a freelancer (I was working in-house for a big life-style magazine at that time). This resulted in the position of German Munchkin editor, which led to more translations and freelance editing, and also took me on countless convention trips. In 2006 the stars were right to infiltrate the German game company Pegasus as in-house Marketing, Event, and Community Manager (= Organized Play) plus Editor-in-Chief of all things SJ Games-license related. You will find my name in the credits of all current German editions of Munchkin, the Chez Geek line, and Illuminati. Did you hear about the geeky German Munchkin promotional items like the Black Belt of Munchkinism, the Munchkin Cthulhu Tentacle Protector, or the Star Munchkin Release Towel? They have made their way into reality from my brain. But now it’s 2012 and I realized my expertise of event management at conventions, game clubs, and game stores; of release event series, games day series, and tournament series -- including German nationals and European championships -- should be taken to a higher level before the world comes to an end. So when Steve asked me if I wanted to wear the Control hat, it absolutely felt like coming home. The first few weeks here at what I think is absolutely the coolest game company in the world have been very exciting and full of progression, and the newly-founded SJ Games Sales and Marketing department which I form together with Ross Jepson, Monica Valentinelli, and Randy Scheunemann, has been bursting with great ideas for future MIB activities. The MIBs are out there, prepared to bring you more gaming fun than ever before. And I am one of them. You’ll meet me at this channel or at the really big SJ Games events yet to come.